(Nanowerk Spotlight) Organic solar cells are conventionally made from two materials: a donor and an acceptor, which facilitates an efficient charge separation. For the acceptor, the most commonly used molecule is one of the blue absorbing fullerenes. This leaves the absorption spectrum of the donor material responsible to cover as much as possible of the solar spectrum. But most organic semiconductors only have a small optical bandwidth. Consequently, solar cells based on such materials only catch a small part of the solar spectrum. This problem can be overcome with a properly designed stacked or tandem configuration, in which several organic materials are tuned so that each absorbs a separate part of the spectrum, thereby increasing the efficiency of the overall device. High bandgap semiconductor materials are used to absorb the short wavelength radiation, with longer wavelength parts transmitted to subsequent semiconductors. In this context, researchers have set great hopes in the development of multi-junction solar cells, hoping to substantially exceed the performance of single-junction organic photovoltaics. In theory, a solar cell with an infinite number of junctions could obtain a maximum power conversion efficiency (PCE) of nearly 87% under highly concentrated sun light. The challenge is to develop a semiconductor material system that can attain a wide range of bandgaps and be grown with high crystalline quality. New research coming out of the Yang Yang lab at the University of California, Los Angeles (UCLA), one of the leading labs for organic tandem solar cell research, presents an efficient design for a triple-junction organic tandem solar cell featuring a configuration of bandgap energies designed to maximize the tandem photocurrent output. The key innovation in this study, reported in the July 14, 2014 online edition of Advanced Materials ("An Efficient Triple-Junction Polymer Solar Cell Having a Power Conversion Efficiency Exceeding 11%"), is the demonstration of organic materials being able to mimic the record-setting efficiency of triple-junction structures in III-V solar cells. III-V based solar cells constructed with the industry-standard GaInP/GaInAs/Ge technology have achieved the highest energy conversion efficiencies of all solar cells, with the current record exceeding 40%. "In III–V multijunction solar cells, the optimal arrangement for a high-current-output triple-junction tandem cell features one wide-bandgap absorber (2.0–1.85 eV), one medium-bandgap absorber (1.4–1.2 eV), and one low-bandgap absorber (1.0–0.7 eV)", Chun-Chao Chen, a graduate student in Yang's lab and first author of the paper, explains to Nanowerk. "This optimal design rule cannot be applied directly to organic solar cells, however, because of the lack of efficient donor materials having bandgaps as low as 1 eV. Therefore, we set out to determine a practical combination of bandgap energies for triple junctions to develop an efficient organic tandem solar cell structure." For their design, the team used three materials with different energy bandgaps (1.9, 1.58, and 1.4 eV) as electron donors, blended with fullerene derivatives. With this arrangement of bandgap energies, they fabricated a highly efficient triple-junction tandem solar cell having a PCE of 11% – exceeding the record efficiency of a double-junction tandem solar cell, previously demonstrated by Yang's group as well. The specific problem in triple-junction solar cells is the complicated optical interference effect between each subcell included in the tandem. "When there are two junctions in tandem, the optical effect is easy to resolve," say the UCLA researchers. "However, when it comes to triple junctions, you can not use trial and error to find out the optimal layer thickness for absorption for each subcell." To solve this issue, and in order to understand how each subcell works and how much current it can deliver, the team carried out in-depth and detailed optical simulations for each subcell. Benefiting from this tool, they came up with a simple and effective structure for connecting the subcells in tandem solar cells. 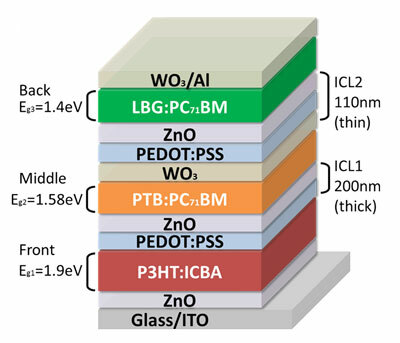 This interconnecting structure, made of WO3/PEDOT:PSS/ZnO, is completely solution processed, thus keeping the orthogonal processing advantage of organic solar cells unchanged – regardless of how many junctions are added. According to the UCLA team, "this design significantly strengthens our faith in tandem structure for organic solar cell." They also points out that one of the outcomes of this study is the message that innovations in device architecture can potentially push the efficiencies of organic solar cell technology into the realm of inorganic photovoltaics. The team is confident that their experience and knowledge gained from designing tandem solar cells can be transferred to other photovoltaic technologies – e.g. hybrid solar cells; perovskite solar cell; CIGS solar cells. Last year, for instance, they have shown that tandem structures can be combined with existing semitransparent solar cell design can result in a doubling of efficiency (read more: "Transparent film could coat windows, smartphone screens with energy-harvesting material").